About 80% of beef producers support beef traceability. But most of them do so cautiously. That’s an important initiative that resulted in new report released at NCBA’s 2018 Annual Convention in Phoenix: U.S. Beef Identification and Traceability Systems: Opportunities, Obstacles and Incentives Across the Value Chain. The comprehensive study, performed by World Perspectives, includes literature review, economic analyses, industry surveys and qualitative interviews. 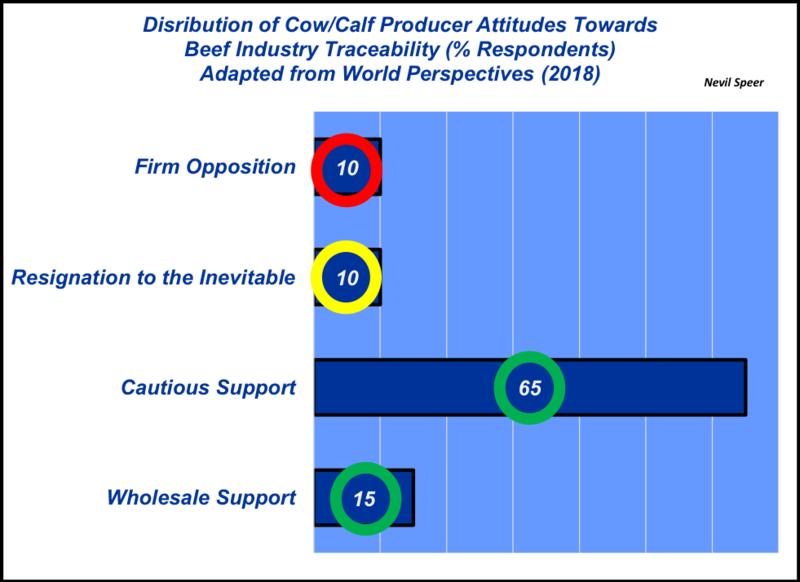 One of the most important components of the World Perspectives study includes assessment of producer attitudes regarding the necessity of traceability within the industry. Accordingly, the study summarizes, “the range of responses to the question of 1) implementation of, or 2) integration with a nationally significant animal identification and traceability approach for cattle.” Those results are highlighted in this week’s Industry At A Glance. The results indicate that approximately 80% of cow-calf producers could be categorized as supporting those efforts. Meanwhile, 10% categorize themselves as resigned to the inevitability of a broader program going forward, and only 10% indicated firm opposition. Where do you find yourself on the scale of firm opposition to wholesale support? What’s are your view of the results – do they match what you’re hearing out in the country? Where do you see the beef industry headed in the years to come with respect to traceability? Leave your thoughts in the comments section below.